There’s not much I hate more than not being able to see. When a person or an object blocks my view, I might stand on my tip toes, turn my head, stretch my neck, and do whatever I can, but sometimes you just miss it. It drives me crazy when I miss it. At the same time, there’s not much I enjoy more than seeing. Seeing my wife and child playing in the yard when I get home from the office. Seeing a beautiful sunrise over the mountains. Seeing a friend. On vacation my favorite things to do are to go somewhere I’ve never been, eat their local food, hike, and see incredible stuff. There is so much I still want to see. In John 9 Jesus meets a man has never seen anything. Never seen a smile. Never seen the stars at night. Never seen a friend or a stream or a tree. Nothing. He was born blind. He couldn’t work. He couldn’t support a family. He was a beggar. Until Jesus changed all that. In an instant, Jesus gave this man a gift that no one else could. What indescribable joy and opportunity now lay in front of him. And as amazing as that story truly is, that’s not actually the true point of the event. John doesn’t just tell stories for the purpose of learning history. There are levels to his stories. Levels of what the characters in the story are experiencing. Levels of what the original readers are thinking many years later. And deep spiritual levels of truth from which we are all to glean. The “signs” are truly about that deeper spiritual level. 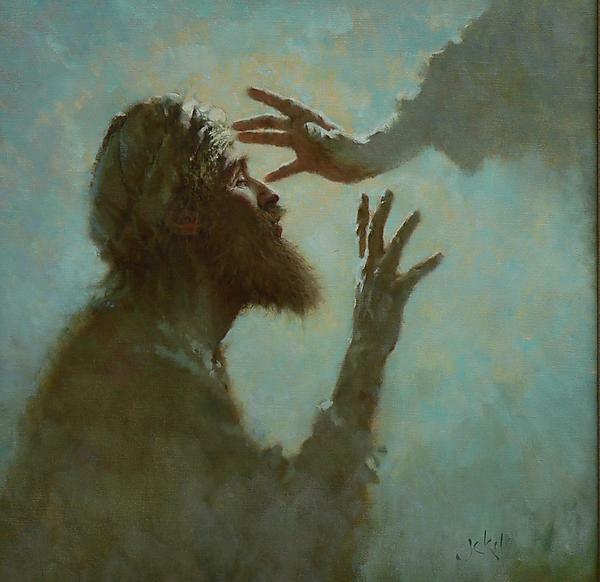 Jesus did an amazing sign by giving sight to this blind man. But what does that sign point towards? What does it actually mean? I think the true point of the sign is seen at the beginning and the end of the event. Before healing the man, Jesus is asked whose fault it was that this man was born blind? Jesus responds, “It was neither that this man sinned, nor his parents; but it was so that the works of God might be displayed in him. We must work the works of Him who sent Me as long as it is day; night is coming when no one can work. While I am in the world, I Am the Light of the world” (John 9:3-5). This is how Jesus introduces the sign. Think for a moment about God’s original creation. Think about the blissful Garden of Eden. There was no sickness, infirmity, or death. There was no blindness. When Jesus restores this man’s sight, He is not necessarily only doing a brand new thing. He is also doing a very old thing. He is restoring this man to what He was originally created to be. In God’s original creation no one was to be blind. Jesus is engaging in New Creation, He is giving this man a glimpse (literally) of what life on earth was supposed to be. Jesus does it over and over again. Eden seems to be the goal of so much of His ministry. His teaching on divorce goes back to Eden (Mark 10:6-8). His reversal of the Adam’s sin (Romans 5:18) is a return to Eden. His miraculous healings show people what their lives were supposed to be, what they would have been in Eden. Resurrection goes back to the ideal in the garden with the tree of life, when there was no death. Sin is responsible for our expulsion from the garden and all the darkness and pain and suffering and death which are present in the world. Not because “this man or his parents” sinned, but because the entire world is in darkness and “men loved darkness rather than the Light” (John 3:19). This blind man is a picture, an illustration, of what Jesus is doing in the world. He is, in a very real way, recreated Eden. He is redoing what God did in Genesis 1. Perhaps this is how Jesus will “work the works of Him who sent Me” (John 9:4). God’s work is creation, light, and goodness. By being the Light of the World, and giving sight to the blind, Jesus is doing God’s work. This blind man represents the world without Jesus. Giving him sight is a picture of Jesus’ ministry, an illustration of His Light which shines in the darkness and enlightens the world. However, not all will come to see. The flip side of Jesus’ ministry is that many who think they see will be revealed to be blind. The blind one who was believed to be a sinner (John 9:2, 34), ends up believing and worshipping and justified. This is the positive side of Jesus’ ministry. But to those who think they can see without Jesus, He says, “For judgment I came into this world, so that those who do not see may see, and that those who see may become blind” (John 9:39). This healing really shows the blindness of the Pharisees. An incredible, unprecedented, miracle has taken place right in front of them, The obvious thought is stated by the man born blind: “Since the beginning of time it has never been heard that anyone opened the eyes of a person born blind. If this man were not from God, He could do nothing” (John 9:32-33). The Pharisees had eyes to see this man. They had eyes to see Jesus. They had eyes to see an incredible sign had taken place. But rather than seeing the Light of the World, they were blinded by it. What does this sign mean? Jesus is Light. Some will begin to see everything because of Him. Some will be blinded because of Him. What we must answer is what will the Light of the World do with us? Thanks be to God that He can give sight to the blind!